I always want to give my kids a healthy breakfast. But some mornings, we get a late start, and there's just not enough time to get in a homemade, hearty breakfast. That's why I was glad to hear about Nature Valley Breakfast Biscuits. Each package of Nature Valley Breakfast Biscuits has 4 delicious biscuits packed with 26 grams of whole grain energy to keep you going, no matter where your day takes you. They're located in the cookie aisle of major supermarkets, including Publix. Be on the lookout for exclusive savings on Nature Valley Breakfast Biscuits at Publix. 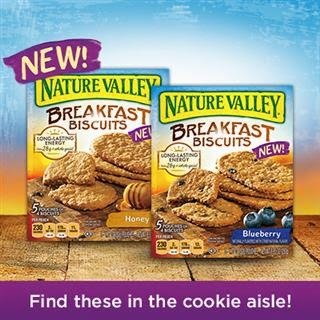 Here's a great printable coupon for 50¢ off Nature Valley Breakfast Biscuits. 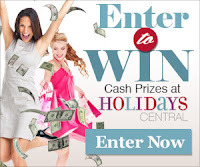 Combine 2 printings of this coupon with a buy one, get one free sale to save even more! I gave the blueberry flavor of Nature Valley Breakfast Biscuits a try. They come in 5 individually-wrapped package to keep them fresh, 4 biscuits to a package. I was expecting a biscuit, but these are more like English biscuits - that is, cookies. I was happy to see that the product contains no trans fats, no high fructose corn syrup, and no artificial flavors. I thought they tasted good enough to be a snack, not breakfast. The blueberries were chewy and flavorful and the cookie was crunchy. They were definitely yummy! On the down side, I noticed that both sugar and honey are ingredients; sugar was the third most common ingredient and honey was the sixth. I have to wonder if they were both listed as a single ingredient, it would be the top ingredient in the biscuit. I try to avoid having overly sweet breakfasts for my kids. And despite the cookies having 26 grams of whole grains, they didn't strike me as being particularly filling as a breakfast. So I think these biscuits would be a great, healthy snack, especially a morning snack, but I really doubt that I would use them to replace a child's breakfast. But they are definitely delicious, so I recommend them as a great morning snack!